Monitor Duty has posted, thanks to Newsarama, the cover to Infinite Crisis #2 and boy does it look sweet. It even includes references to the "Pre-Crisis" era. Woot! The Newsarama site also includes the Perez covers for issues 3 and 4. If you want to understand a little more about the whole "Infinite Earths" thing, I recommend reading the collected Multiple Earths Graphic Novels. They are Crisis on Multiple Earths Vol. 1, Vol. 2, Vol. 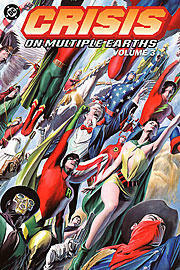 3 and Crisis on Multiple Earths: The Team Ups Vol. 1. The "Freedom Fighters" who played a large role in Infinite Crisis #1 are heavily featured in Vol. 3.